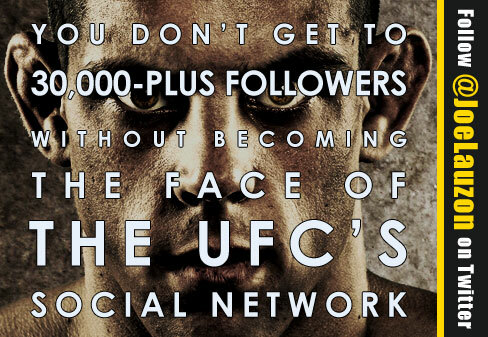 Joe Lauzon has been called the UFC's Mark Zuckerberg of social media. He has actively maintained whatever was hot at the time from Myspace, Youtube, Facebook, Twitter and recently Google Plus. At the recent Fighter Summit, a yearly meeting between the UFC and it's fighters, the topic of social media was covered in depth. Unlike some other organizations like the NFL (aka the No Fun League) who discourage social media, the UFC has embraced it. Dana White routinely gives away hundreds of tickets to UFC events in whatever city he is in for that week's event using his own personal twitter. When the UFC gave a long talk about social media and its importance, Joe was paying close attention for anything he didn't know… but he really felt like he could have given the talk himself. "Years ago, I was blasting out bulletins on Myspace about Ultimate Fighters blogs I was doing from week to week. I come from a computer science background and understood right away the power of social media and the reach it had. I finished school in 2006 but for me, the learning never stopped. I just became more focused on stuff I was interested in, which was making the most of social media. And making the most of it he has. Joe has over 34k followers on Twitter, over 18k fans on Facebook, and over half a million views on his Youtube channel, where he posts video blogs and other videos. Joe Lauzon gets it. Yesterday, Joe took another step forward and launched his very own iPhone app. The "Joe Lauzon Mobile" app has quite a few instructional videos, video blogs, training injuries, and other random videos. It also has an announcements section for event tickets and other fan giveaways, a photo uploads section and an MMA news section. 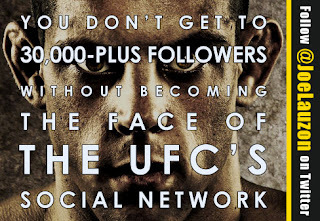 Look for Joe to continue being a front runner for the UFC in their social media effort, and check out his app athttp://joelauzon.com/iphone/. It's been a long time coming, but my iPhone app is finally done and in the app store. It's completely free, has instructional videos, ufc predictions, my first amateur fight, most of my fight blogs and a ton of other videos. Also has a MMA news section, a blog section and all my photo uploads.